Highland County resident Aaron Anderson has announced the release of his first book titled “Philippians 4:13.” The book is published through Christian Faith Publishing and is based in Pike County in the community of Elm Grove, where he grew up. As a minister and a motor coach operator for Croswell out of Williamsburg, Anderson has traveled the United States and Canada. While traveling, he became a Christian author. Anderson, along with his wife Ingrid and sons, have made Highland County their home for the last 28 years. His book is available online through Amazon, Barnes & Nobles.com, Books-A-Million.com (BAM), Walmart.com and is coming soon to iTunes. It is also available at Becky’s Relaxation Station in Greenfield. 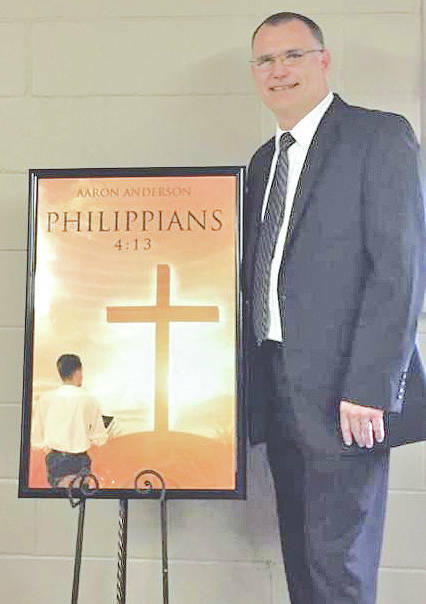 https://www.timesgazette.com/wp-content/uploads/sites/33/2018/06/web1_Anderson-book-pic.jpgHighland County resident Aaron Anderson has announced the release of his first book titled “Philippians 4:13.” The book is published through Christian Faith Publishing and is based in Pike County in the community of Elm Grove, where he grew up. As a minister and a motor coach operator for Croswell out of Williamsburg, Anderson has traveled the United States and Canada. While traveling, he became a Christian author. Anderson, along with his wife Ingrid and sons, have made Highland County their home for the last 28 years. His book is available online through Amazon, Barnes & Nobles.com, Books-A-Million.com (BAM), Walmart.com and is coming soon to iTunes. It is also available at Becky’s Relaxation Station in Greenfield.